Besant technologies provide you the best selenium training in Chennai by qualified experts having 10+ years of experience. Our experts will offer you top selenium training based on present standards of the industry. Looking for the most reliable selenium training in Chennai? We have many institutes in different areas of the city, including Tambaram, Velachery, Omr, and Porur. Students, however, sometimes face difficulties while understanding the components of Selenium, including Selenium WebDriver, Selenium RC, Selenium IDC, etc. Furthermore, it has been listed among the top trending software technologies in 2018. 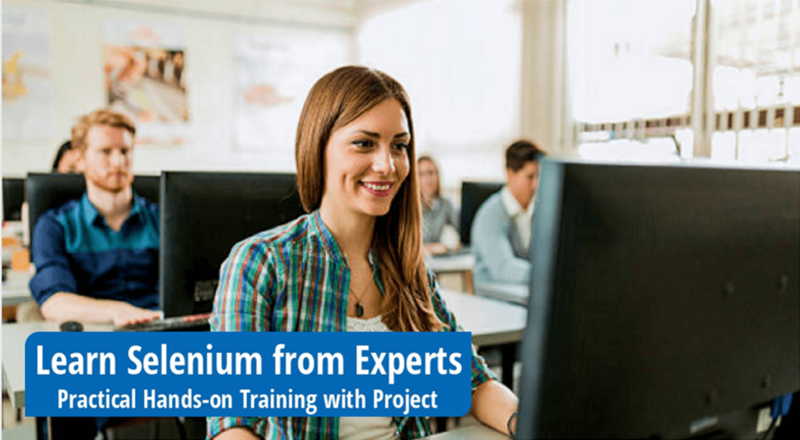 Connect with Besant technologies as we offer you the best Selenium training in Chennai that can help you get equipped with all the concepts of this technology. Selenium is a prominent open source automation tool, allowing users to write test scripts in different programming languages like C#, Java, PHP, and Perl. It helps to execute scripts in parallel. Due to its free availability, Selenium is becoming the most favored tool of choice that caters to all automation needs perfectly. We, at Besant technologies, have a team of experienced Selenium professionals that help you train in the best possible way. Selenium training in Chennai by Besant technologies helps to provide you a proper knowledge and understanding of the technology. Our Selenium tutors cover every single concept starting from beginner to advanced level. Moreover, you’ll be guided with all the applications of Selenium with real time scenarios and practical training. This will help learners to get a good exposure of the interviews, when they go for placements. We understand the importance of industry exposure for a leaner, thus our team guarantees to provide you all the knowledge of on-going trends in the corporate world. Practical tests and other assessments will be offered to students to improve their programming skills. Why do you need Selenium Training? In today’s world, Selenium training is one of the fastest growing technologies for automation testing to meet business needs. According to the latest report, Selenium is used by almost 70% of IT companies, resulting in an increased growth of automation testing. There is a huge need for testers who can validate mobile applications and software. Thus, many famous multinationals are seeking professionals related to the same. We at Besant technologies have structured whole syllabus and include many things in our Selenium certification course, such as Selenium components, an overview of Selenium RC, Maven, TestNG framework and other advanced applications. As per the business wire, Web testing continues to become popular, resulting in an increased requirement of Selenium experts in the industry. Selenium WebDriver, one of the popular Selenium tools helps to provide a friendly API, making the test easier to maintain. Our best Selenium training in Chennai helps you get job designations such as QA engineer, Quality engineer, senior test engineer, Automation test lead, Selenium Automation analyst, etc. We, at Besant technologies, provide you with the best Selenium training in Chennai. Our experts provide you the desired value for your bucks and promise to make you enriched in Selenium technology.